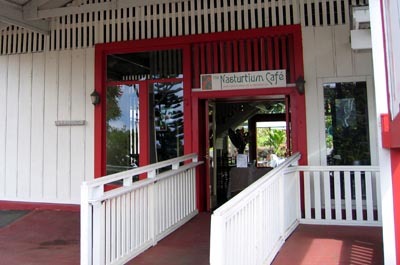 Stopped for lunch today, finally, at the Nasturtium Café in Kainaliu. It’s just outside of Kainaliu town proper on the south side. 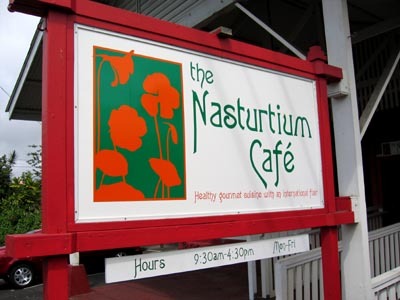 I had passed by here many times, before I had seen a sign saying Seven Senses Café and now it says Nasturtium Café. I finally found myself with some time instead of rushing past as usual on my way to or back from assignments. The re-worked wooden building is very easy to find is nice inside, it also has a nice outside lawn dining area in the back as you go through the resturant. I almost ordered the ostrich tenderloin quesadilla for lunch, I’ve never had ostrich before and it’s supposed to taste more like beef than my imagination of chicken. Instead I ordered the Chevre Goat Cheese and Artichoke Wrap. 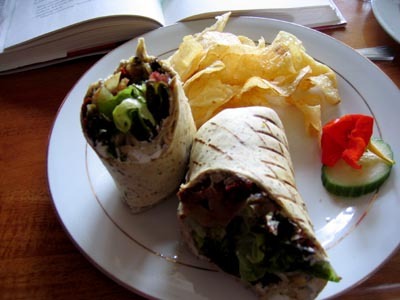 I’m not normally a big artichoke fan but the vegetarian wrap sounded pretty good and healthy. In fact you can see that I totally forgot to shoot a photo and took a bite or two before I remembered, duh. 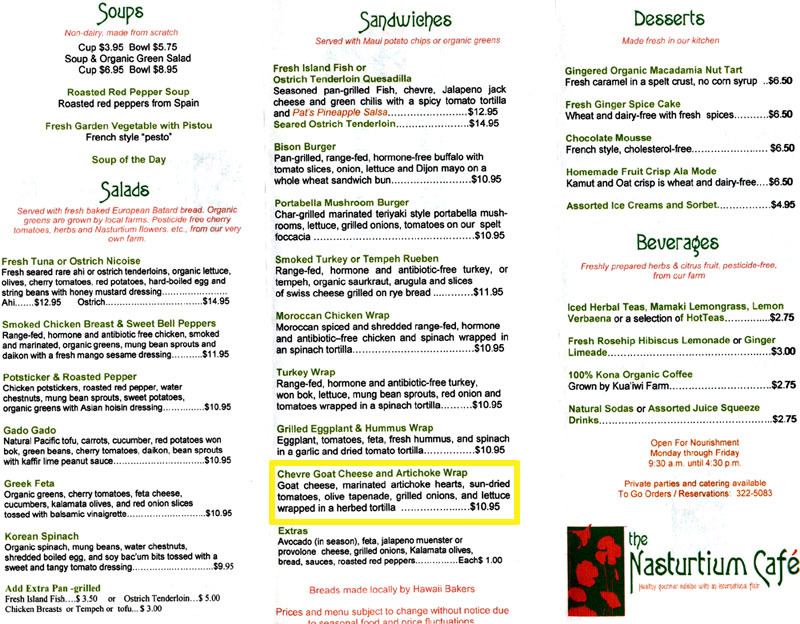 Here’s a copy of their menu (hint: click on it to see a bigger image) and I have what I ate outlined. 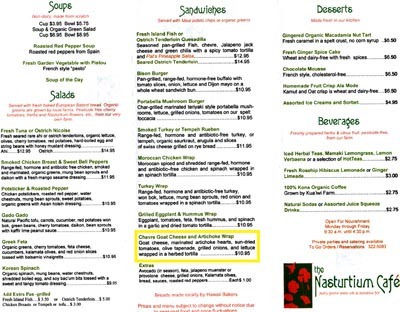 The menu on their website a little outdated. I’d highly recommend this place as a great place to eat. It’s a little noisy in the resturant due to the traffic close outside the door but with soothing music inside it covers it a bit and if you want to get farther away from the street noises you can always head back to the outside area. I talked to the owner Diane and she said she cooked and ran the Seven Senses Café with some other folks but she changed the name and now she runs it by herself. 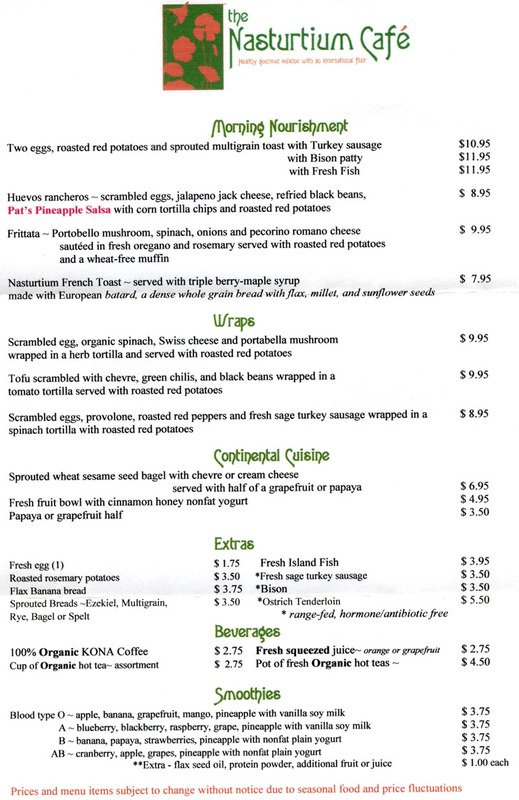 They are open Monday through Friday 9:30 a.m. to 4:30 p.m. and have a pretty tasty looking breakfast menu (click to view). Next PostNext Whip it out and make your mark.Get out and vote.